Burmese democracy icon Aung San Suu Kyi has been freed at last, but does that mean freedom for the people of Burma? Perhaps the answer would be that we need to remind ourselves that the road to democracy in this military-ruled country is still long and arduous. 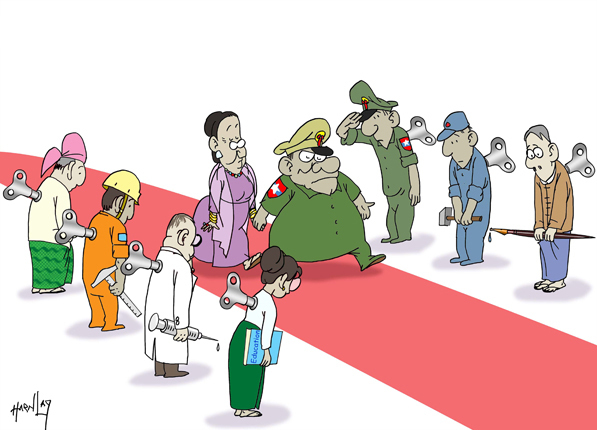 If the recent election is anything to go by, then there is very little hope that democracy will unfold in a manner that supporters of Suu Kyi would like to see. Having had the opportunity to see the election from very close quarters, I would say that the biggest worry is the way the military junta played a part in robbing all elements of fairness from the franchise. While most of the attention seems to be on the Election Commission (EC) and the junta-backed political party, the Union Solidarity Development Party (USDP), what is being overlooked is the direct involvement of the junta in the electoral process. Those who ventured out to observe the balloting process were witness to blatant manipulations of common electoral law. In a number of places in Mandalay, military personnel stopped the counting process halfway, without citing any reasons whatsoever. In Kyaukse Township, National Democratic Force (NDF) candidate Khin Maung Than, who contested a parliamentary seat against Burmese Minister of Science and Technology U Thaung, openly castigated the EC for a lack of transparency in the polling and ballot-counting processes after the count was halted. However, what transpired during the meeting, according to sources who were privy to the discussions, was that the results needed to be changed as the USDP candidates were found to be trailing. According to eyewitness accounts, military vans were spotted near the polling stations. The vans are said to have carried extra ballots, which were used to change the actual results. “I have seen it with my own eyes, and I am sure there is something fishy going on,” said Thint Soe, a journalist who covered the elections. A similar report from Mandalay was flashed on the BBC the day after the election. These are definitely not hearsay, but “real see” reports which support the speculation that the junta went all out to not only ensure that it did not allow any room to the opposition parties, especially the NDF and its allies, but also to prevent these opposition forces from getting anywhere close to the 25 percent mark needed to convene Parliament. The arguments raised in the analysis have been substantiated by events that occurred during election day. “I don’t see any reason why the military should have been so afraid when it had done everything possible to seal the advance votes, manipulate the campaigns and also intimidate and threaten people of dire consequences if they did not vote for their party, the USDP,” said Pongsak Chanon, a senior election observer with the Asian Network for Free Elections (ANFREL). Apparently, in a number of polling stations, the NDF and the Democratic Party (Myanmar) candidates were leading by a margin of more than a 1,000 votes when the count was suspended. “There could be many reasons, but the military junta definitely did not want to take any chances and therefore engaged directly in swapping the actual results with rigged ballots,” Chanon said. The above cases describe only the main methods used by the military junta to manipulate the elections.